The state government on Friday issued a stop-work notice to the Joka-Esplanade Metro project near Majerhat bridge. 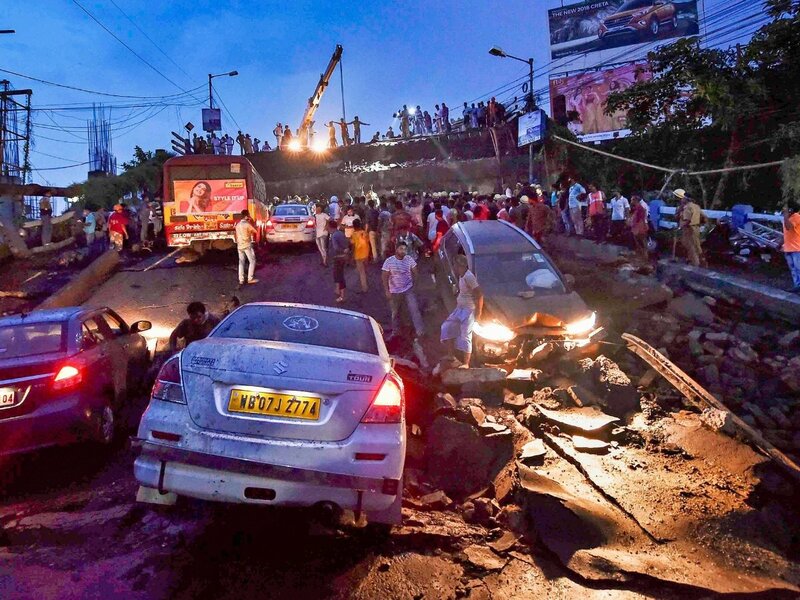 Calcutta: A day after chief minister Mamata Banerjee said vibrations caused by the construction cannot be ruled out as a possible trigger for the bridge collapse. The state government on Friday issued a stop-work notice to the Joka-Esplanade Metro project near Majerhat bridge. “The ongoing work in and around the Majerhat bridge be temporarily suspended till further communications from our end in the interest of the investigation of the above mentioned case (the case filed by police in connection with the bridge collapse at Alipore police station),” reads a letter from Calcutta police sent to Rail Vikas Nigam Ltd (RVNL), the implementing agency for the Joka-Esplanade project. RVNL had asked the contractor, Gammon India, to stop work, said by the railway officials. On Tuesday the construction of Majerhat Metro station had been going on next to the bridge when it collapsed. “On the matter of Majerhat bridge, the chief secretary (Moloy De) will take the opinion of technical experts. We are also speaking to engineers… the chief engineer of our PWD (public works department) has filed a report. The findings of the primary inquiry have been placed before the (inquiry) committee,” Mamata had said during a press conference at Nabanna on Thursday. “S eta hochchhe Metro rail-er je kaaj hochchhe sei kajer jonyo onekta problem kintu ei bridge-er hoyechhe (It says that Metro rail construction is causing the bridge a lot of problems). The inquiry committee will verify the report…. Till then, temporarily we have asked for the Metro rail work to be stopped,” she had said. Railway officials on Friday denied that construction of pillars had caused damage to the bridge but said they would stop work to cooperate with the police investigation. The stop-work notice would affect the entire project, they said. The railways had been aiming to complete the 9km stretch between Joka and Majerhat by June 2021, spurred by an assurance from the Calcutta Municipal Corporation to help acquire land for the proposed maintenance depot in Joka. Construction of the remaining 6km stretch between Majerhat and Esplanade has yet to start. Railway sources said construction work had not progressed in the past three days since the bridge collapsed because of traffic congestion in the area. Metro had reported on Thursday how the supply of construction materials could be hit because of road diversions and snarls. The officials said that the ban on entry of 20-wheel trucks would also have an effect on the project.